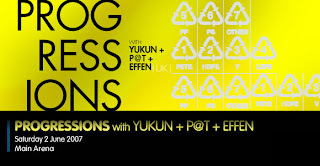 Yukun started his DJing career in 1991 and was launched into the public eye with repeated guest appearance at Zouk’s “Sessions”. He has garnered over a decade of deck and studio experience and over the last 5 years, amassed worthy mentions and credits from all the big international boys after securing the spot of support DJ for the Gatecrasher tours in Singapore. He has been featured with several guest mix sets for the likes of Solarstone's Deep Blue Radio Show and John Askew's show on VONYC. And dabbling in the world of uber cool afterhours sound, Yukun has also been featured many times on Singapore's Lush 99.5 FM's mix show and is currently hosting his weekly mid-week show with the station. Effen stormed into the club scene in 2005, with his first club appearance at Zouk's bi-yearly event Localized!. Since then, he has graced the decks of other top clubs in Singapore such as Onyx, DXO and Liquid Room. He is notorious for tearing dancefloors apart with his main sets, weaving seamlessly the sounds of melodic trance,tech-trance and percussive techno, all into one cutting edge, mind-bending, sonic performance. p@t, known for his trademark thumping styles and his bag of surprises, With countless guest slots in Malaysia, Thailand and Singapore under his belt, adds even more flavour to this night.